A few years ago when I was on vacation I stopped in a shop that carried a large selection of healing stones and crystals. While I was looking around, I overheard a woman talking to the shopkeeper about a pendulum she had been using that no longer seemed to be working correctly. The shopkeeper asked the woman when was the last time she had cleansed the pendulum; that was most likely the problem. After the customer left I went up to the shopkeeper and asked her to explain to me what she had been talking about - cleansing the stones? I wasn't familiar with the importance of clearing and cleansing stones, how to do it, or what to use. After our discussion the shopkeeper gave me a bag of ground Selenite to try for free. She told me put it on my dresser and at night to put my jewelry into it so that it can cleanse and re-charge. I have, and doing a nightly cleansing has really made a difference in how the pieces feel and react. Depending on their usage, crystals and healing stones can become drained of their energies. They can also pick up undesirable energies. For example a stone like turquoise, which is often worn to absorb negative energy, can become saturated like a sponge, holding on to the negative energies that are not wanted. One of the easiest ways to cleanse or re-charge a stone or crystal is to place it in or on top of a piece of Selenite. The Selenite will cleanse the stone by drawing out the unwanted energy and re-charge it to it's original state. In addition to becoming cleansed and re-charged, stones left sitting on Selenite for long periods of time can actually become highly charged. Since receiving and using my bag/bowl of ground Selenite, I've found the mineral available for sale online in some other forms too. One is a rock-like formation (shown above), which is actually very attractive. 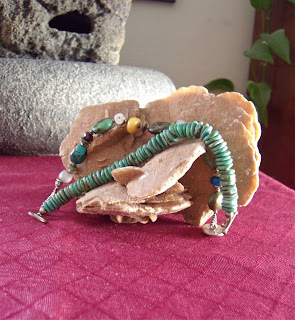 This piece also easily ends itself to having bracelets and pendants draped over it. I also ran across a nice slab or sheet of Selenite in a metaphysical shop in town recently. 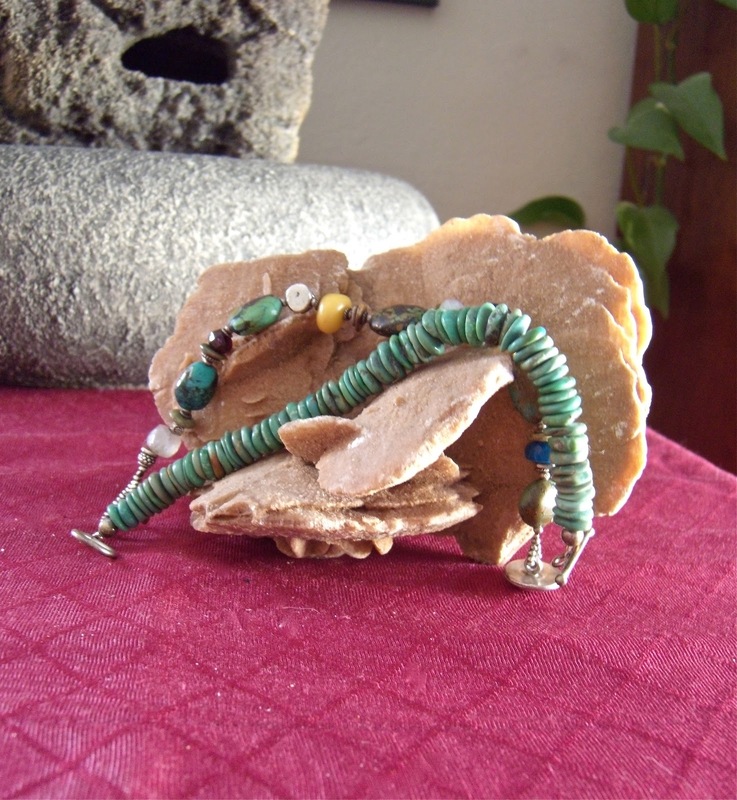 It's perfect for holding bracelets or even long strings of stones or necklaces. The shopkeeper in this shop explained to me how the Selenite slab can also be used as a wand to help cleanse or brush off the aura and ground energy by waving scraping it downward from the crown of the head to the ground. She also pointed out that in addition to it's cleansing properties, Selenite vibrates at a very high frequency and that it promotes intellectual clarity and competency. If you don't have access to a piece of Selenite, another way to cleanse your stones is by running them under water. Some sources say cold water others say warm water. You may want to do some additional research before you try it, but regardless I would rinse them at least once a month, if not more. No matter what you decide to do, you really should utilize some method on a regular basis to clean your stones, crystals and gemstones. Also, whenever you receive a new crystal, stone, or piece of jewelry you should cleanse it before you even consider wearing it or having in your room or on your alter space. Stones and crystals, their energies, and how they hold and absorb other energies is a fascinating topic to read about. As with many things I study, my knowledge base continues to grow everyday and I'm always learning something new and interesting. I hope you are too. Thanks, Diane. I'll put my column of satin spar to this work immediately. Fascinating information Diane! Thanks so much for sharing. If you are looking for SELENITE in all its forms, and you happen to be in New York City or are planning a trip there, you should check out ROCK STAR CRYSTALS, a rock shop and metaphysical store in Manhattan with a hugh selection of healing crystals and minerals at reasonable prices. A recent visit found natural rectangular selenite crystals 6 - 12 inches long, polished selenite massage wands, selenite spheres and eggs, CLEAR selenite mineral specimens from Brazil, and angel wing selenite crystals (the terminations look like angel wings or butterfly wings(. Call them at 212 675 3065 or go to www.rockstarcrystalsmanhattan.com for more information. hi! is it necessary for crystals to be cleaned and charged to touch selenite? or i can do it with selenite sphere just by placing crystals around sphere? You can do it with just the Selenite. Kyanite is another stone that can be used in the same manner. This was really unique and informative about Gemstones thanks for sharing.